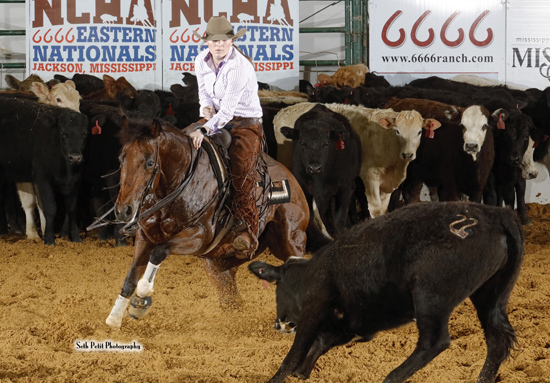 Madalyn Colgrove of Boligee, Alabama and Lyndi Polk of Edwards, Mississippi, the topped the senior and junior divisions, respectively, in the first round of youth competition at the NCHA Eastern National Championships, presented by 6666 Ranch, Saturday in Jackson, Mississippi. Madalyn Colgrove on Hes A Heapinspoonful. Seth Petit Photography. Colgrove marked a 222 on Hes A Heapinspoonful, an 11-year-old son of Hes A Peptospoonful out of Miss Hickory Hill, by Doc’s Hickory. Madalyn’s sister, Blakley, had the next highest score, a 220 on Cat Man Blue, while Ryan Rapp marked 219 on Manteca Moe, the same horse he rode to win the Cattlemen’s Classic Non-Pro finals in Graham, Texas on Friday morning. Madalyn Colgrove’s major Non-Pro and Amateur championships include the Breeders Invitational, Cattlemen’s Derby, and Cotton Stakes. She teamed up with Hes A Heapinspoonful to win the Amateur NCHA Classic Challenge in 2014. Hes A Heapinspoonful has earned more than $147,000, mostly with Madalyn in the saddle. Fourteen Senior riders marked 214.5 or better to advance to Sunday’s finals. In the Junior division, 10 contestants scored 213.5 or better to go to the finals. Leader Lyndi Polk marked 218 on Dual Smart Dee Jay, her horse which won the $5,000 Novice finals last week under Bill Pierce. Lyndi, who was also a finalist with Freckles Half Acre in the Junior Youth at the NCHA Eastern Nationals last year. Her 7-year-old gelding Meradas Dee Jay, also carried Melinda Polk to a third-place finish in the $35,000 Non-Pro at last year’s Eastern Nationals. In addition to regular competition, Lyndi took part in the ever-popular costume cutting in Jackson. It is a constant goal for the NCHA to do its best to work with and fundraise for our youth members. There is no greater pleasure than watching the children of our industry grow up and become successful adults. All efforts of the NYCHA Officers, Youth Committee Members, and Youth Coordinator are committed to encouraging education and growing funding for scholarships for the youth that will become the future of our industry. Sponsors and donors are always appreciated. Be a part of the future with us!